Melissa Rosenberg may be penning the TV adventures of Jessica Jones after all. Deadline is reporting that Melissa Rosenberg, who was involved with the “AKA Jessica Jones” Marvel TV project back when it was at ABC, will be involved as a writer and executive producer for the Netflix take on Jessica Jones. As usual with Marvel projects, this is not yet confirmed by the studio, but as we’ve known for a while, Deadline has reliable sources. No more news is known about the Netflix project, which is one of four series that will be premiering on Netflix beginning in 2015. Deadline does note that the project will be “undergoing redevelopment” in the move to Netflix, though. This news comes only a few hours after it was revealed that Drew Goddard would be writing and showrunning Daredevil. “I love that series [the Marvel Comic Alias], I love the pilot I write for it… but its home is not on ABC, but we’re certainly searching for another home for it,” she said back in March. Jessica Jones, the character, is a former superheroine turned detective. 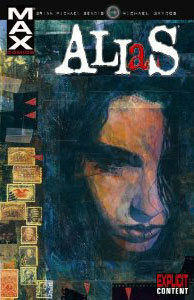 The character first appeared in the comic book series Alias by Brian Michael Bendis and Michael Gaydos.